As I arrived here on my little stats page, I realized that this entry constitutes my 500th post on The Peace-a-Bull Assembly. When I originally began blogging I intended for this space (which was actually started on the Blogger platform) to be a place to document my journey with my boy Ray. Oh, I had such grandiose ideas about the direction this blog would take and the tone it would set. Then life interfered and I believe I may write more about other dogs and other experiences than those of Ray and Julius. And I think that’s ok. While I love, love, love my two characters, I feel that they understand what I’m doing. Every time I come home smelling like another dog, they give me a thorough sniffing and I explain who it is they are smelling and how they are so sweet to give up time with their Mommy so that I can help other dogs like them find families. And so it’s fitting that my intention to write today was yet again not about my Peaceabull boys but about Miss Lucille Ball-Ball-Ball! 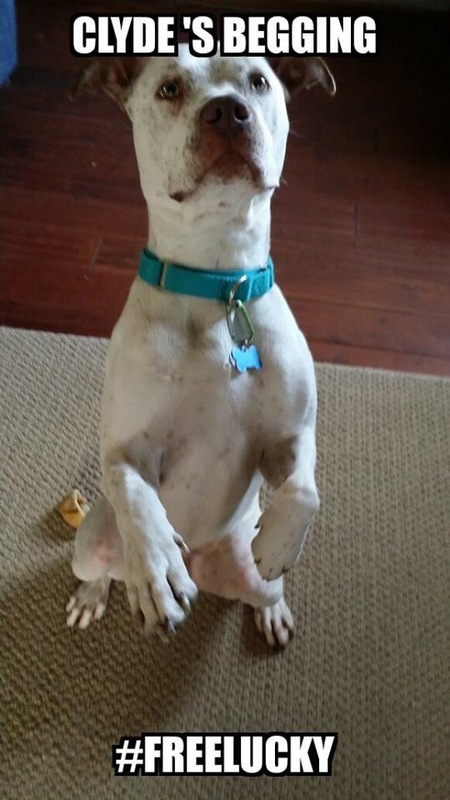 Apart from Marley who has been in foster since December, Lucille is not only the longest current adoptable dog in the Fort Wayne Pit Bull Coalition, she has had very little interest. Actually, that’s not fair because I’ve had lengthy conversations by phone, messenger, email and text about her but the result is that several people have shared that they love her…but none of them have applied for her. Help me figure this out here. The “black dog syndrome” really doesn’t apply around here as we’ve had plenty black dogs adopted within a very short period of time. She’s not an elderbelle by any means, having just turned two earlier this year (by our estimates) and she’s quite attractive and very smart. Maybe that’s it: She is a strong, smart, motivated, independent woman and that can be daunting. Lucille is a quick learner and although she lives in a home with three other dogs, she may want too much to be the Queen of All Things Ball Related. 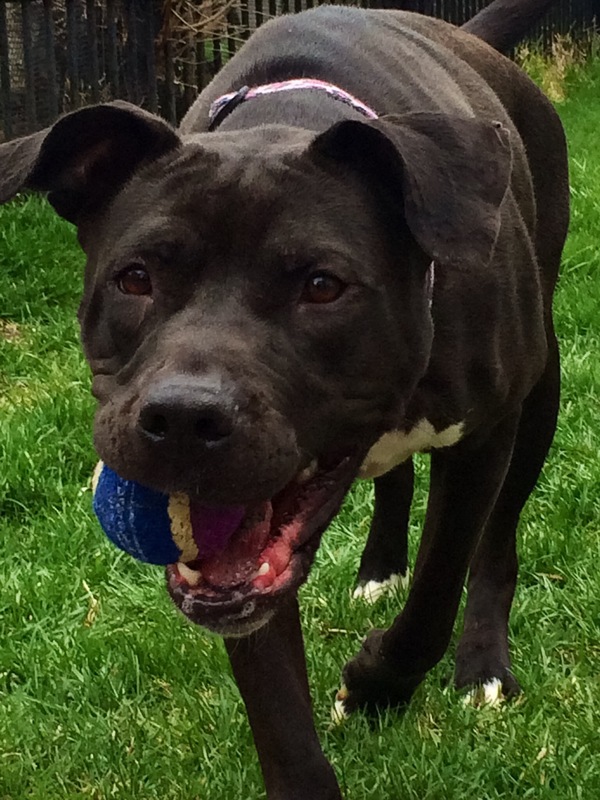 She can play fetch with a ball until your arm falls off so a Chuck-It may be in order for her adopter and although we don’t require a fence, she may be better suited to a home with a tall privacy fence. She behaves quite well on Pack Walks and is really a very good girl who deserves a loving home of her own (who doesn’t deserve that?) so I’m going to implore you to share her story and network this beautiful girl. Talk her up at the gym and in your running club as well as at the Fly Ball Arena (is there such a thing?) and even your local camping group. 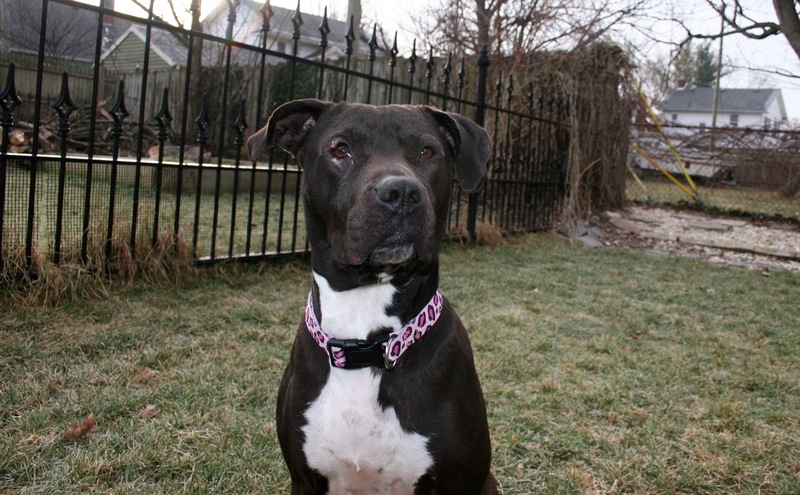 This girl needs a home and an active family or person would be just the ticket. Thanks for sharing and thanks for hanging with us through Five. Hundred. Posts. ing days of the month with this post but bear with me, I have my reasons. Every October for the past several years I’ve embraced the concept of Pit Bull Awareness Month and celebrated all things Ray and Julius while working towards broad acceptance of seeing my boys and all other Pit Bull types of dogs as individuals, not as lumped sums of their breed, or breeds as the case may be. 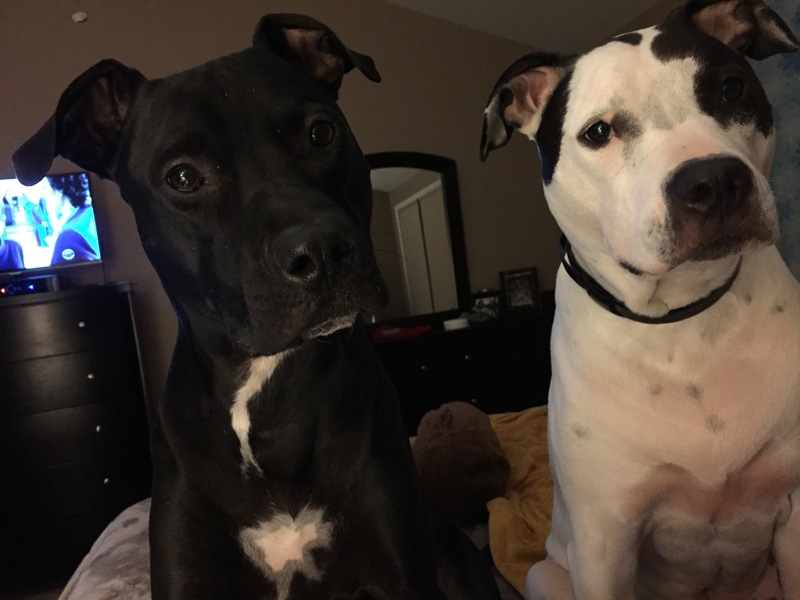 My boys are both Pit Bulls in the broadest sense of the word and yet they share absolutely no similar breed DNA. They are individuals. In light of all of the ballyhoo with PeTa joining forces with the vitriolic group that I won’t link to here I was planning to sit out this round. 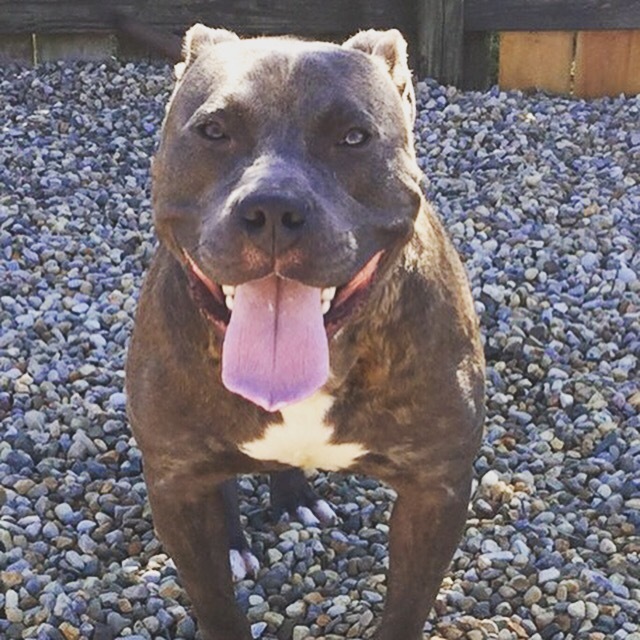 I was asked by a friend and fellow Pit Bull Coalition member to help find an avenue to help spread awareness to the right people. Here’s the thing: in person I’m pretty confrontational and blunt. 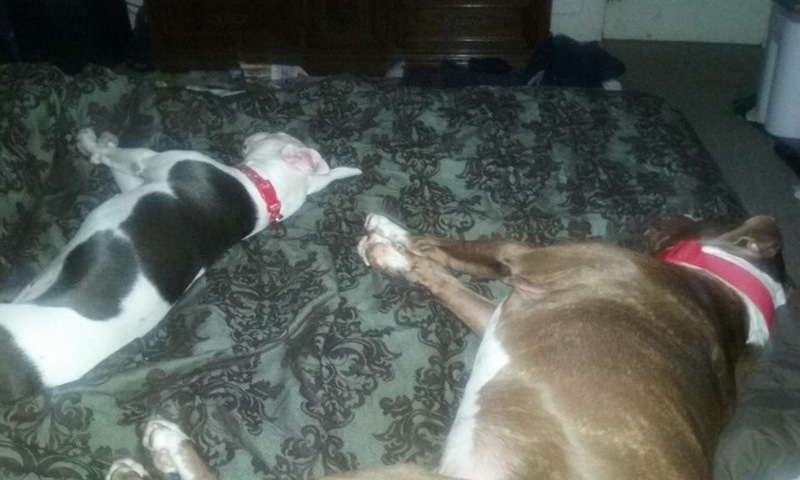 If you threaten or malign my dogs (or anyone I care about) I could very easily try to pull your eyeballs out with my fingernails while trying to figure out ways to really hurt you but when it comes to mudslinging and manufactured “statistics” from zealots, I try not to give credence in the form of attention. Much like when you are training a dog in a positive manner, you ignore the unwanted behavior and reward the desired behavior. 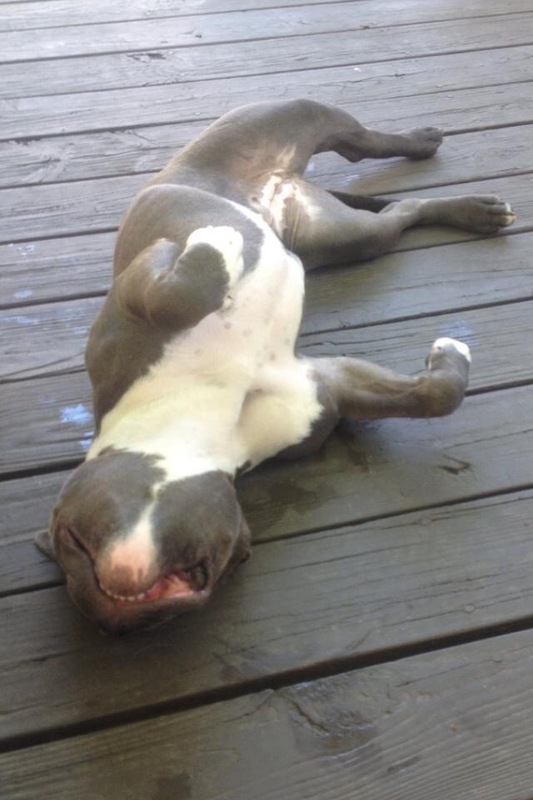 PeTa contends that it would be best to kill all Pit Bull types for their own good to save them from the criminal element who want to adopt them. 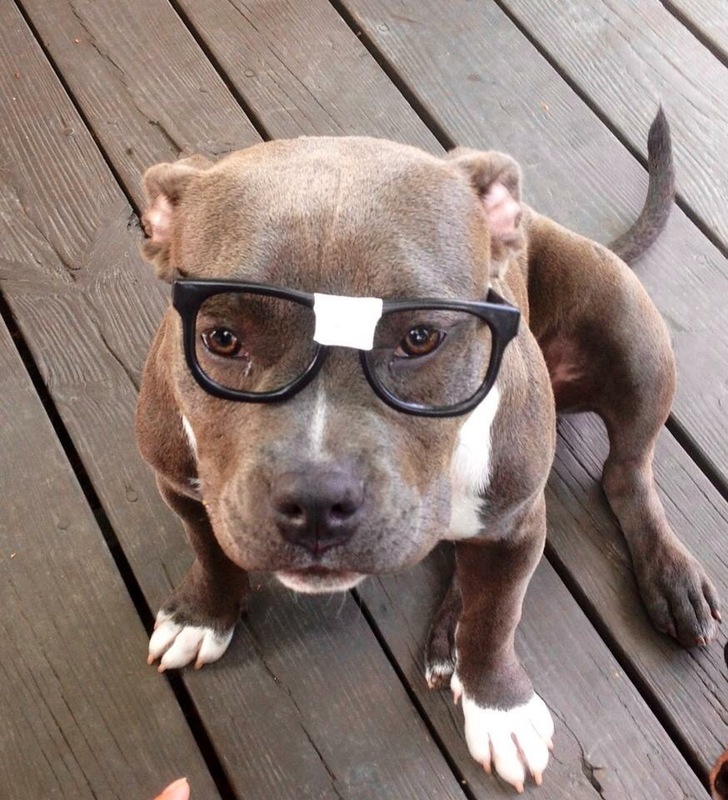 There aren’t many words in that sentence that I don’t take issue with but many people more reasonable and more informed than I have addressed such lunacy, so I won’t bother other than to point out that of course, I don’t want to see Pit Bulls abused, but I don’t want to see any animal abused. I just don’t think that killing them all will solve the issue. Well, that was quite the cliffhanger, wasn’t it? I meant to finish out the Tale of the Blues and talke about “Iron’s” hashtag on Friday, but not only did scheduling not permit, but Fate intervened as well. Chance’s story was going to be about how Asia regretfully decided to let him go. 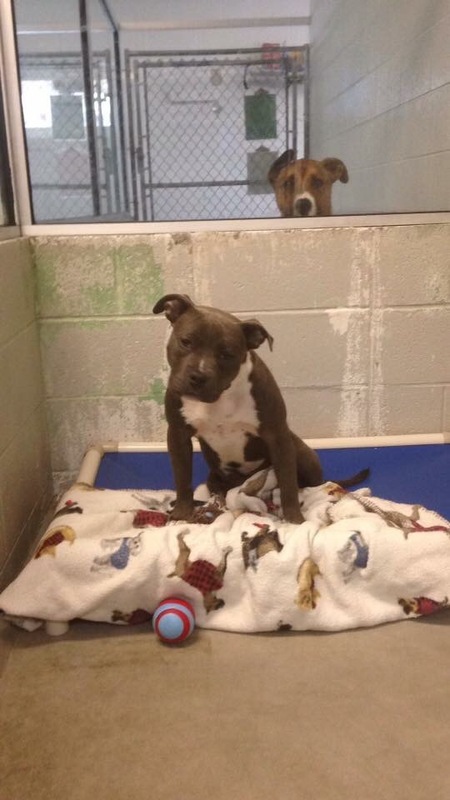 She had told him during her visits that he would be coming home to live with her and ultimately with all of the newness, as well as a foster pup, she agreed to see if his true family would show up. She gave them 30 days. 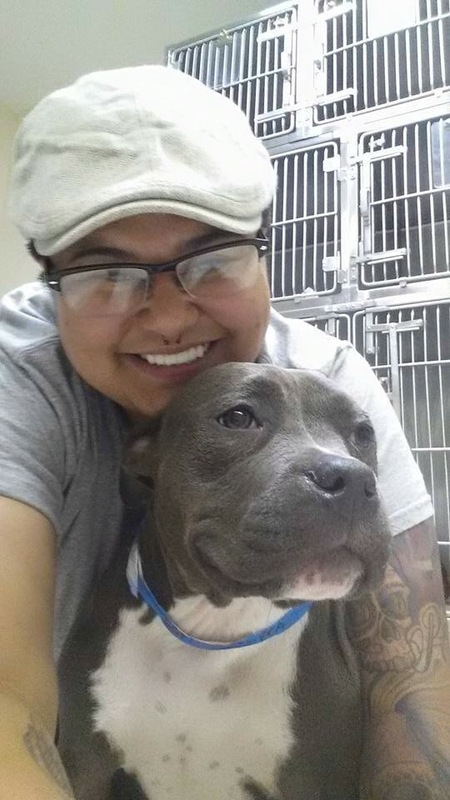 On Saturday August 15th I had an urge to visit “Iron” at the shelter and as I was driving down there, I received a text that a wonderful couple were in and going to adopt Iron. As luck would have it, I was able to meet this couple and they were, in fact wonderful. In the back of my mind, I felt a little sad for “Iron.” He would be an “only dog” which may make him a little sad, but it might work out in the end. That is the story we would have published on Friday. A beautiful day dawned full of promise and anticipation. Today our little Pets for Life team would finally be hitting the streets and knocking on doors to begin our mission of helping our neighbors retain their pets. We were going to be able to offer spay/neuter, vaccines, preventatives and food among other things all for free to this specific area. What nearly marred this glorious day was the message I received that “Iron” was coming back to the shelter. The funny thing about this, though, is that it didn’t upset me or even make me sad. It felt right somehow. The adopters were distraught to return him (along with the mountain of belongings he had amassed in just 7 days) but due to some neighboring dogs trying to fence-fight, he returned as they say “through no fault of his own” and with the feedback that he is, in fact, perfect in a home. I’m not sure why, but I just couldn’t feel upset about this return. I hugged the big wiggly lug when I saw him and I let him know that it was ok and I would always be around to look after him. Another Sunday and another Pack Walk with The Bully Collective. 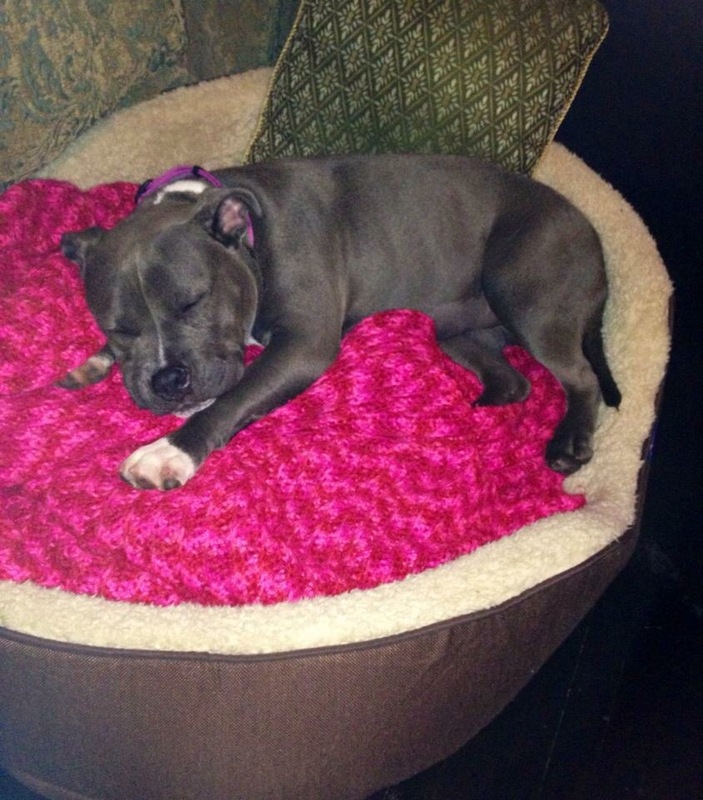 As has been her custom, Lisa had arranged for a couple of volunteers to come and walk adoptable dogs. 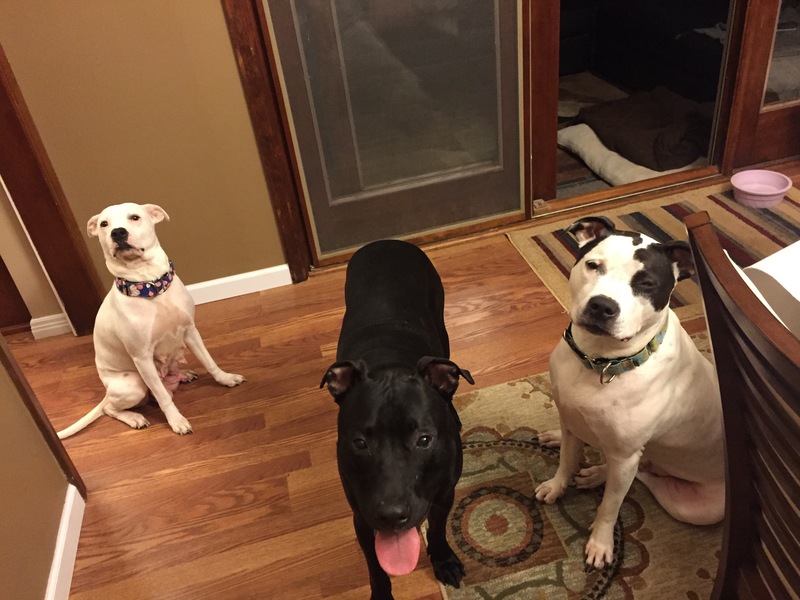 One of those dogs was meant to be Bitsy, Asia’s foster dog but as fate would have it, Bitsy had been on a two-night trial and on Saturday night we received the message that Bitsy had found her forever home. That allowed for her walking partner to be available for Iron/Chance. A nice long pack walk was followed by some impromptu Bro time as Clyde came over and the three boys had some quality play time in the yard. I loved seeing Chance waddle-trundle along after the sleeker Clyde and Julius. It was so much like a little brother trying to keep up with the big guys. As Lisa and I watched the adora-bulls play in the yard we agreed that someone in our large family of friends needed to adopt Chance. We couldn’t bear the thought of not seeing him regularly. I considered it over and over again. He and Julius got on well and Ray would be given all the time and space he needed and even the name could work. My boys are named after football players, so Chance might not work but Iron? Iron Mike, of course would be perfect! After Clyde went home, I loaded Chance in the car and decided to make a pit stop at Asia’s house. Since she had company over everyone was in the back yard I text her to make sure Ms. Cranky (Sugar) was on a leash. 95% of the time Sugar is great with other dogs but there have been a couple that she wouldn’t tolerate so I wanted to be sure there would be no incidents. There weren’t. Asia didn’t receive my text on time and as Chance and I walked in the far gate, Sugar greeted him as if he were a long lost brother. 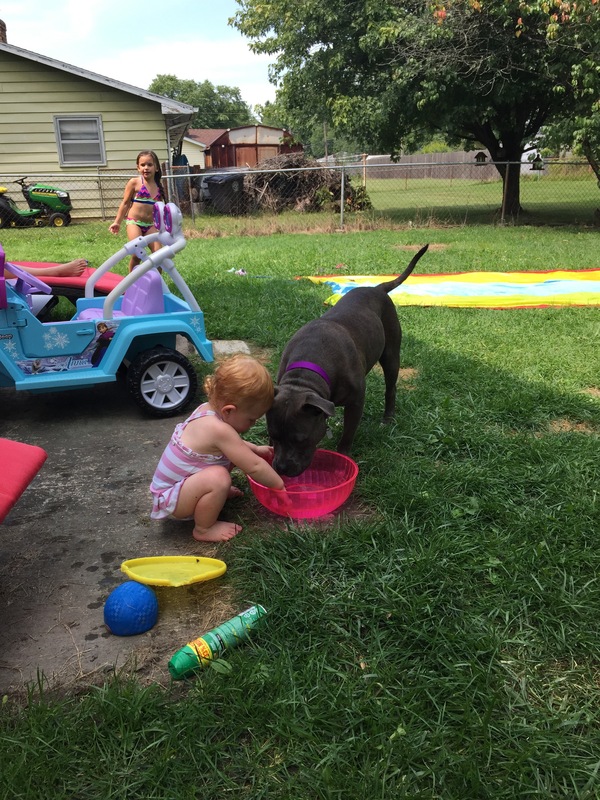 Chance played with Sugar, romped around the yard, followed the little (human) girls around and drank his fill from the water spurting out of the Slip ‘n Slide. An hour before the shelter was to close, I called and got assurances that no one had come in to visit with him so I let them know he wouldn’t be back for “curfew” and since the shelter is closed to the public on Mondays, he wouldn’t be back until Tuesday. There’s no mistaking the joy on Chance’s face when enjoying all of the activities of the day. Going from Pack Walk to a play date with the Big Boys, to a play date with Sugar, Slip ‘n Slide fun with three girls ranging from 1 – 5 years of age to all of the different locations in just one day back from another home would make anyone exhausted or even over-stimulated. Chance aced the day as if it was just business as usual. and on Monday morning Asia emailed me, “I think he is meant to be with us. It’s been one month since I met him, I tried to let someone else adopt him, and it didn’t work. It’s a sign.” My response? Technically, Lucky/Ion/Eden never made it to the adoption floor. 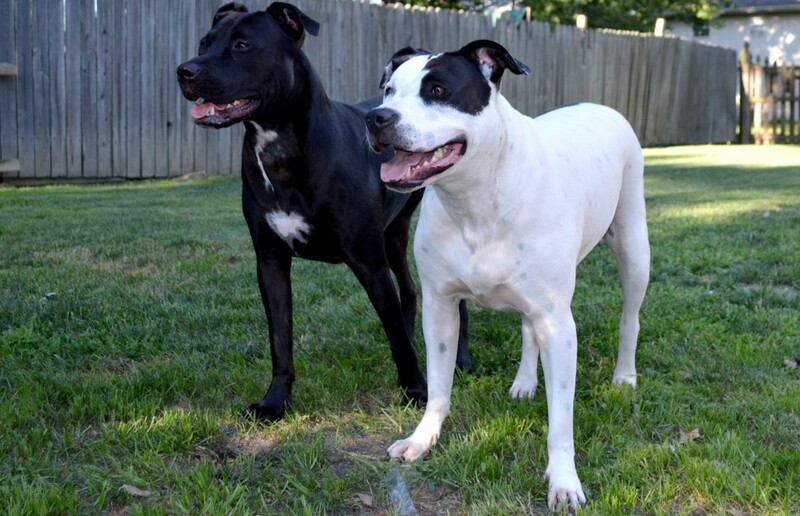 Cassie and Melissa had adopted her immediately after her spay, so her name was listed without any picture other than “available soon” to mark her presence. Chance had a different story. On the day they were both transported for their surgeries, Chance was found to have a cold and could not be operated on and thus not yet ready for adoption so he would remain a guest of the Allen County SPCA for a bit longer but was already creating a small buzz. 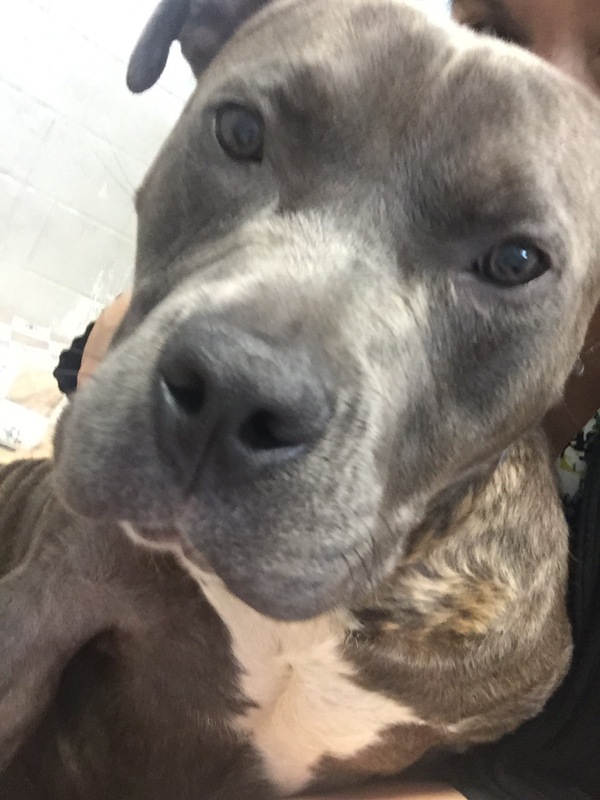 The Blues had arrived at the SPCA on Friday and on Saturday and Sunday I did something that could have impacted his future. Saturday morning Asia and I went to the shelter to visit the Blues and she immediately fell in love became obsessed with Chance. He was, after all pretty spectacular in so many ways. He was calm and affectionate and while Eden bounced all over him and jumped on his head and his back, he remained steadfast and happy, giving more credence to the theory that he was her father. Though he was sweet and affectionate with us, it was clear that Chance was a dog’s dog-he loved being near other dogs, especially little Eden. His tender, gentle acceptance of her was inspiring to see. 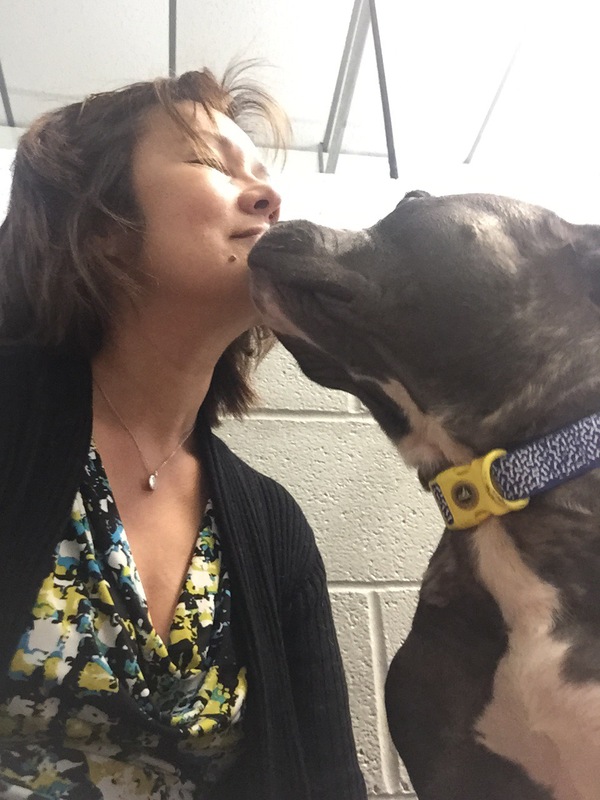 The following day, the hubby and I had to run an errand that took us to the shelter and I used that opportunity to introduce him to the Blues. I rarely do that but when I do, it’s to plant a seed, because there’s always that just in case case that comes up. Little did I realize that little seeds had been planted in Asia’s heart as well and on that Monday she informed me that not only did she submit an application for Chance, she had called to ensure that her faxed application had been received and already scheduled a meet and greet for him and Sugar. As much as I already loved Chance, and thought that he would make an excellent addition to the family, I wasn’t convinced that it was the right time or circumstances. For as much as I pressured gently encouraged Cassie and Melissa, I wanted to be sure that Asia was separating Chance’s back story with her urge to adopt him. As far as the circumstances in Asia’s household, she had just purchased her new home, adopted Sugar and began fostering Bitsy all before even the first utility bills began rolling in. Luckily since his neuter was delayed, so would be his meet and greet which would allow me to really work on if not changing Asia’s mind, at least to get her to think the decision through more carefully. In the meantime, I pulled out all the stops. 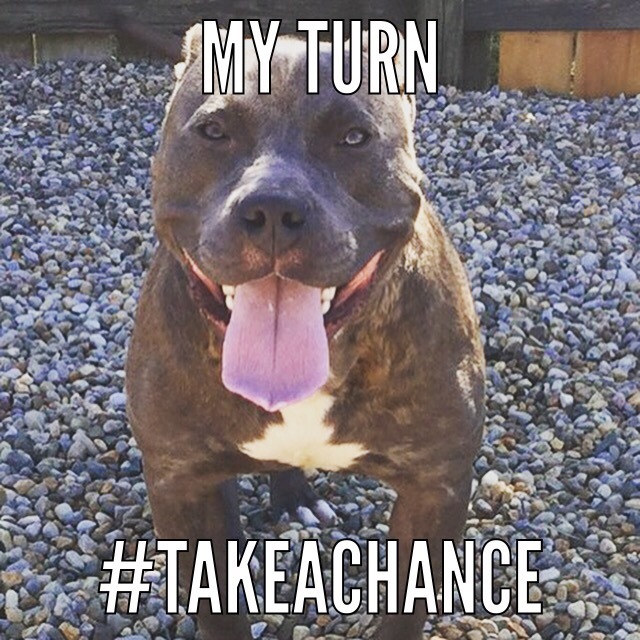 The time commitment, the financial commitment, the loss of a crucial foster at a time when good foster homes for pit bulls were scarce were all arguments I cited while trying to get her to reevaluate her decision and ultimately I asked that she at least wait to see if another family would come along that would be in a position to give Chance all that he needed. Not that Asia wouldn’t, but instead of being the second or third in a home, he should have an opportunity to find a family who needed to love him. He deserved that chance. If after 30 days he was still available for adoption we could reevaluate. There’s no denying that Lucky and Cujo were in fact two lucky dogs and oh my goodness, if a name was ever wrong for a dog, then Cujo was it. We began referring to him as Chance; he’d gotten several by now and yet The Blues still got other new names at the shelter. Ion (Lucky) and Iron (Cujo/Chance). I’ll admit, I really never called them by their new names much; Lucky and Chance they were in my mind and my heart. These two were definitely wiggling deeper into my heart, I mean, how can you carry a dog into a clinic, wear her blood on your shirt (like a badge of honor) and not feel like you are now somehow bound together? Can’t happen. Lucky is about 10 months old and presumably Chance’s daughter. She’s a stocky little low rider who wiggles into you as if she’s trying to osmose into you to get that much more loves because she’s never met a stranger and is absolutely positive that all of humanity was set on this Earth specifically to love and dote on her. She’s probably right about that. Soon after the weekend, the pair was sent to H.O.P.E. 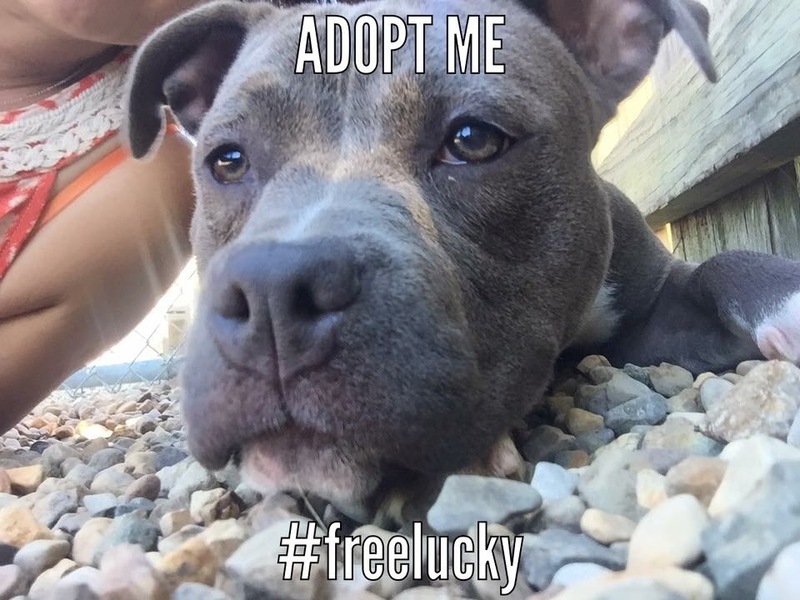 for their surgeries where Lucky’s lucky streak continued. 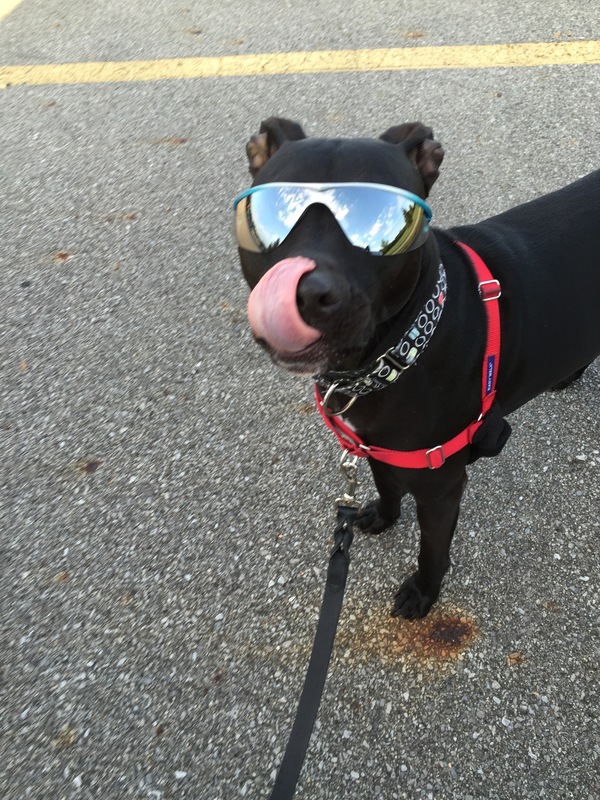 There’s a fabulous woman (and friend) who loves Pit Bulls has been volunteering with the Fort Wayne Pit Bull Coalition by walking foster dogs at our Pack Walks and we’ve joked that she is a lucky charm because the last three dogs she walked were almost immediately adopted afterwards. She also works at H.O.P.E. and though she was at the June Pets for Life clinic volunteering, it was at H.O.P.E. where she re- met and fell in love with Lucky all over again prompting a Facebook campaign that had me in stitches and tears. 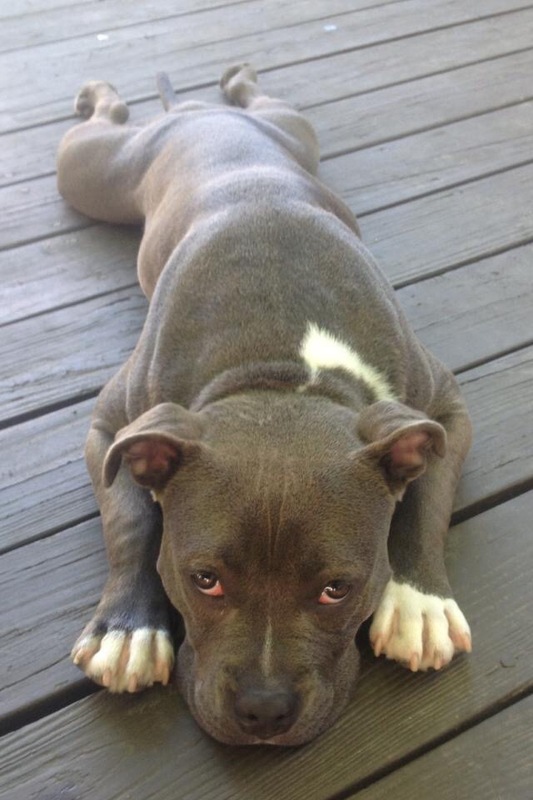 Ironically I had just recently had a text conversation with her partner about her level of readiness for a “large” dog and how all of their friends, especially all of us crazy committed pit bull people would be there to support them but understood the reluctance since they are newly settling into a new home. Friends, ever supportive that we are began a very low pressure, reasonable show of support for Cassie’s campaign which became known as #freelucky. Ultimately,and in record time the campaign worked and Lucky’s fate rested in the paws of the two resident dachshunds. It’s hard not to be human. By that I mean, we humans are so flawed, so imperfect and can be so judgmental but the very foundation of Pets For Life is to put aside our judgment, our prejudice and remember love isn’t measured by the riches you can bestow on your dog but it is our common bond between the volunteers and the public who will stand in line –in the rain- for hours to have their dog vaccinated. The majority of these dogs had never seen a Veterinarian, had not ever been vaccinated. Some dogs were filthy and smelly and were on leashes made of rope, but in they came with their proud and grateful owners. This series is not about blame. It’s about hope and caring and love. 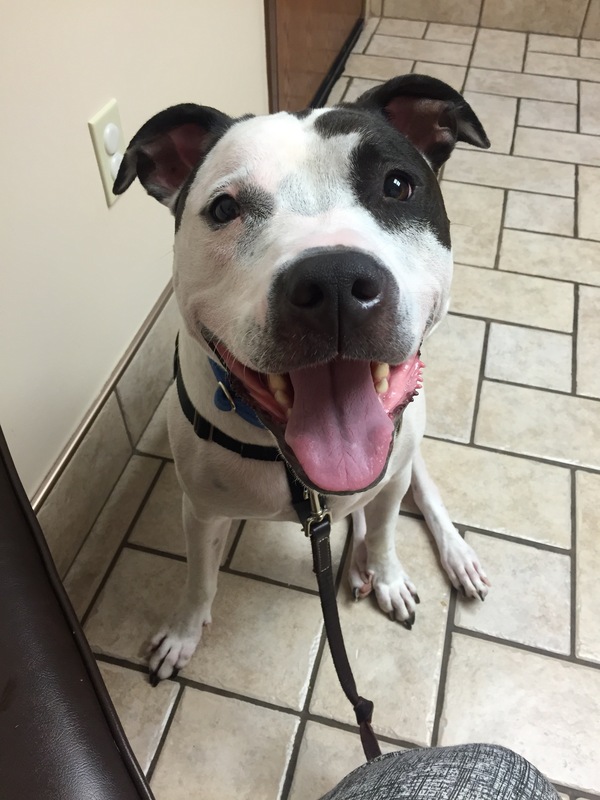 Approximately a month after the PFL Clinic, I happened to be perusing the Animal Care and Control page of lost dogs and came upon Cujo’s picture. 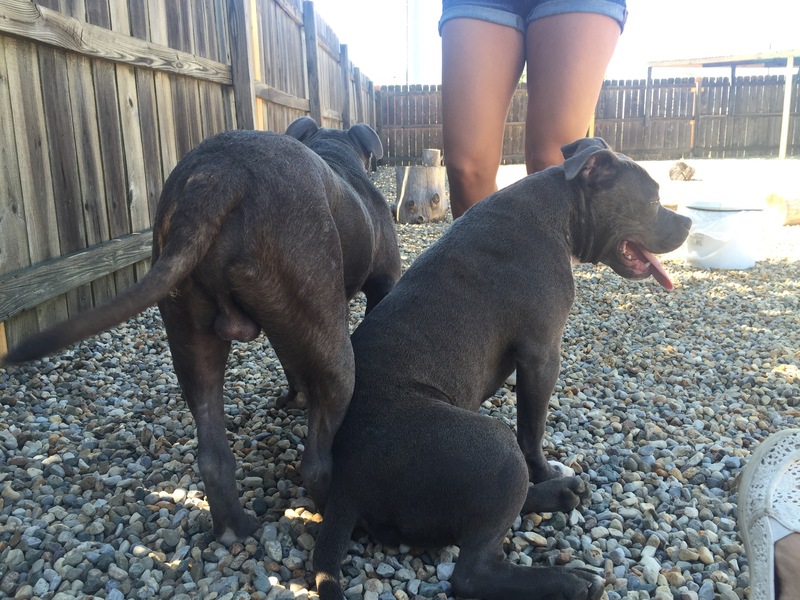 If you had come up to me on the street 5 minutes before that and asked the names of the two blue pit bulls from the clinic I would have known immediately who you were asking about but I wouldn’t have been able to remember their names. I knew it was “our” Cujo the moment I set eyes on the picture and immediately contacted our Pets for Life coordinator to see if she could get the scoop and the following day Lucky’s picture joined the website. 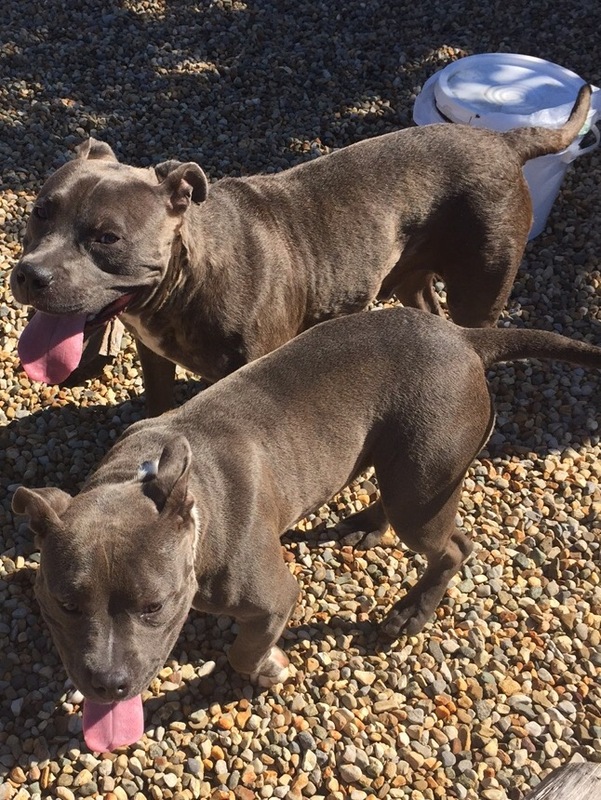 “Our” blue PFL dogs were on stray hold at Animal Care and Control but their owners had been contacted and indicated that they would be in shortly to reclaim. Whew. Then days passed. And another. And then the weekend. “Our” dogs showed up at ACC during an especially heavy week of Pit Bull intake which decreased their odds. 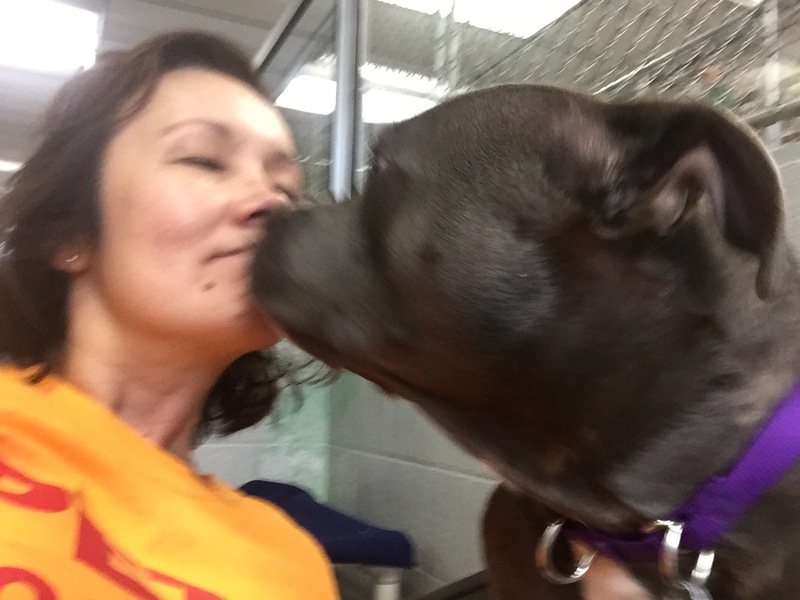 ACC already had two pit bull ambassadors and the third qualifier went to The Pit Bull Coalition who was beyond full, the SPCA was full and had at least two pittie types. The reports coming from ACC were that Lucky and Cujo were staff favorites, which was a plus. Finally on Monday I was in full on panic mode but tried to keep it together. Stray hold was up. 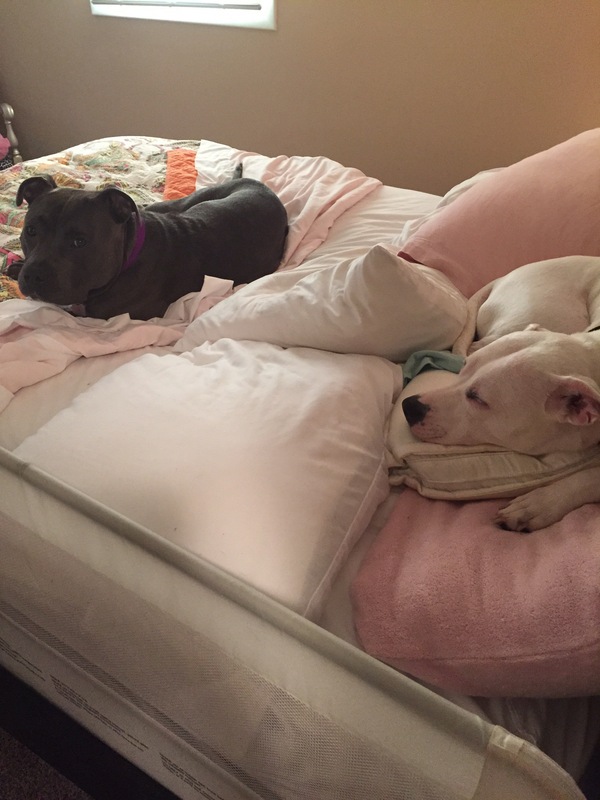 I contacted our long suffering ED at SPCA and hysterically spewed rationally updated her about Lucky and Cujo. 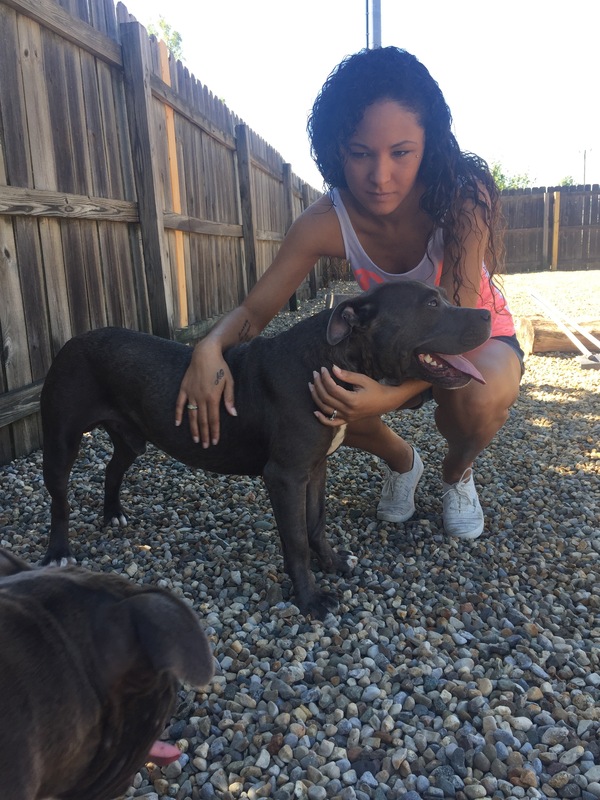 It turns out that the day they were called by ACC, one of the owners showed up at SPCA trying to reclaim both dogs and after the confusion in locations was straightened out, she left indicating she would head to the correct location. So on D-Day, we were trying to piece all of this together. The dogs went stray, the owner came to the wrong location to reclaim, did not show up at the correct location but gave every indication that they would do so. On Tuesday emails began flying between SPCA and ACC: could the Blues just have another day or so to try and locate the owners again? 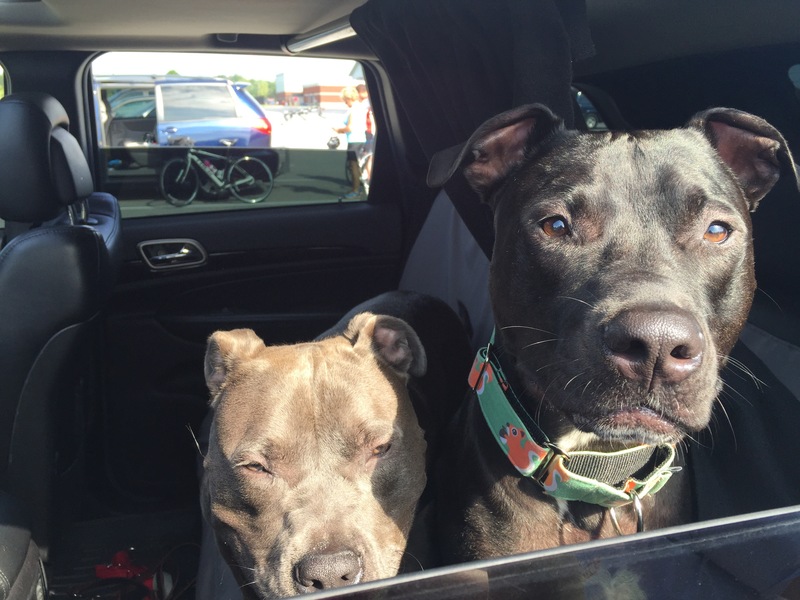 If the delay was in the reclaim fee, we would cover that to ensure these dogs went back to their homes. We would do whatever it takes to keep these dogs in their homes, but eventually something had to give. Phone calls to the owners went unreturned then finally the phone line was disconnected. The Blues had both passed their evaluations and were now biding their time waiting for a break. As it turned out, on Wednesday I was pulling Bitsy from ACC to take to her foster home and upon inquiring about the Blues was informed that they had been “tagged” by SPCA. Regardless of how rational our conversations were and how much Jessica and I assured each other that we couldn’t save them all, she saved these two. By Friday they were ensconced in the SPCA and ready for the next steps: spay/neuter and adoption. The problem I have with my own social media is that I hesitate to inundate people with the same info over and over again on each outlet and that I forget that there are those folks who only follow along on certain outlets so there are “holes” in my info sharing. Case in point is that I wanted to reference our Pets for Life clinic in June for some posts this week only to find that I never did blog about it. 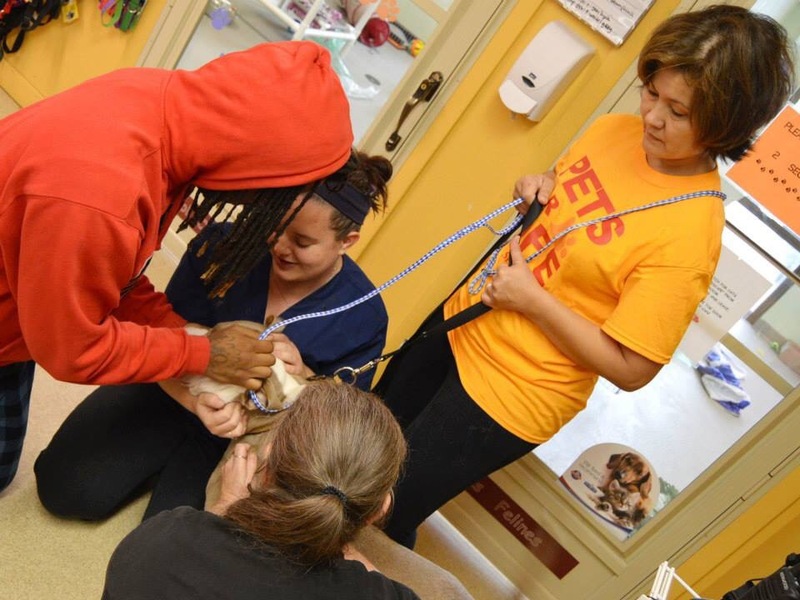 Last year, our shelter director asked me if I’d like to attend a Pets for Life seminar in Detroit with one of the shelter staff and that seminar really struck a cord. This initiative which is about serving those pets who live in underserved parts of our community and assisting the people who love them. 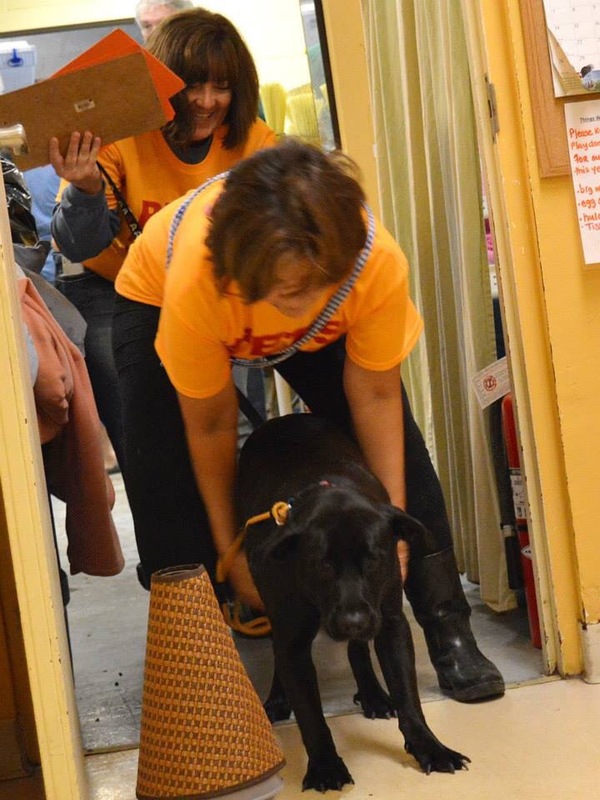 I’ve loved volunteering at our Pet food Pantry and this initiative not only dovetailed nicely with that, it really amplified everything that we’d be able to offer folks. This Spring, in conjunction with the staff at H.O.P.E. for Animals, our low cost spay-neuter clinic, the Allen County SPCA began making plans for a free clinic to be held in June. Having pooled our resources, we found that we’d be able to offer Rabies, distemper, microchips, ID tags, flea treatments, collars, food, leashes, some nail trims and offer information about spay and neuter. After months of planning the morning of the clinic dawned to a torrential storm that brought down mighty trees all over the city. Would we cancel? Would we reschedule? We had local Veterinarians and Vet Techs volunteering their time, regular volunteers ready, premeasured vaccinations in the fridge and finally, lines of citizens beginning to form in the miserable drizzle that continued after the storm swept through. Lines of dogs and the people who love them ready to receive that much needed dose of vaccines. With some quick thinking and arranging, the clinic proceeded as planned. Dogs of all shapes and sizes received their chips and vaccines while their owners received food and supplies if needed and rather than feeling tired or daunted by the lines, each new little paw that walked through the door gave me that much more energy and sense of purpose. Naturally there were Pit Bulls through the doors, but there were so many dogs of all shapes and sizes that were truly reflective of a diversity of taste in our community. Most were well behaved and those who were slightly less socialized were brought in separately and given all respect, consideration and space. Thankfully those owners waited their turn in line and upon reaching registration were given the instructions on how and where to bring in their dog who was given the works in the comfortable space off the lobby. And then we met the Blues. 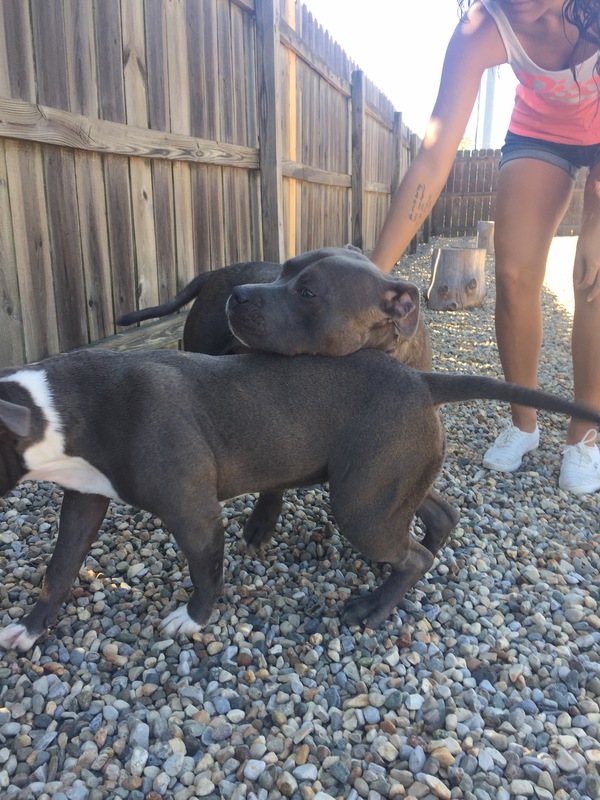 I wasn’t the parking lot greeter, so I didn’t hear the whole story at the beginning, but two women came to the line who had literally just come to own two pit bulls 30 minutes before arriving and arrived at nearly the end of the clinic. They had acquired these two dogs from a neighbor or something and remembered hearing of our free clinic, so loaded the dogs in the car and headed over. 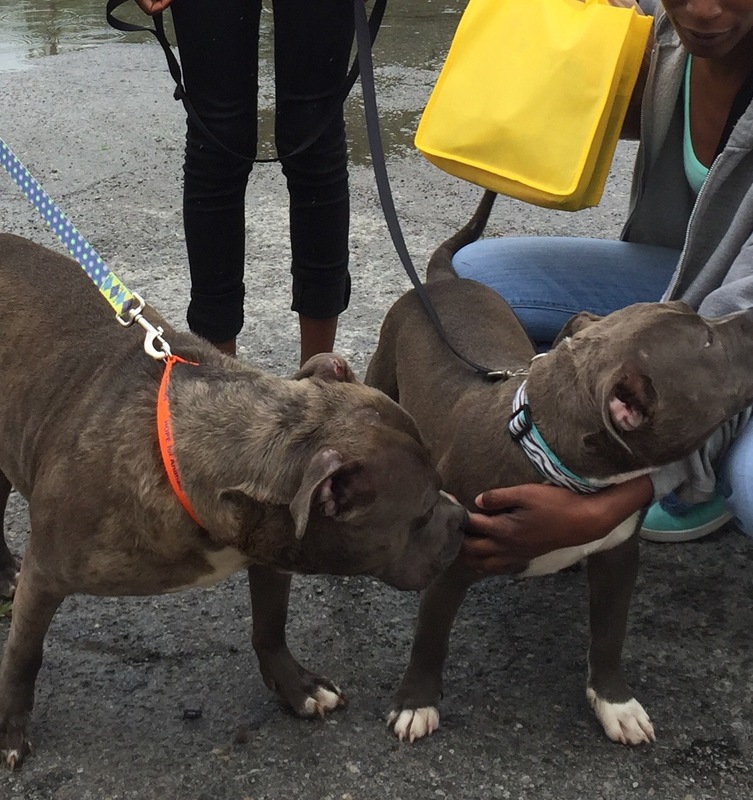 Not knowing the dogs or their personalities, the ladies secured their spot in line and when it was their turn, I accompanied them to get the first of the two dogs. The male, named Cujo came out first. He was a calm “little” blue hippo who was unsure about what all was occurring, but stood stoically for his shots and chip. Upon his release, we tried to guide him down the exit hallway but he dug in and wouldn’t budge. I asked the volunteer to open the door so that Cujo could see that it was a “good” hallway and out to the parking lot he trotted lumbered. With Cujo taken care of I returned for Lucky. The young female had a large gash on her hind leg so I carried her to the clinic for her turn and along with her vaccines and chip, the docs set her up with some healing salve and told the owner to bring her to HOPE the following week for a check up. The two ladies told us they were first time dog owners and we all ooh’d and ah’d over how exceptionally sweet the two dogs were and that while Lucky certainly was lucky, Cujo definitely needed a new name. Many of the collars and all of the leashes were gone, so I ran to the pittie van to ransack my supply and came up with two leashes and a collar as well as a couple of bowls. From the clinic, we found a suitable collar, a full 30 pound bag of food and the offer of a crate if they’d come back for it. The little group left with all of that as well as my personal card and that of the Fort Wayne Pit Bull Coalition so that if they needed anything they could reach out and we’d be there. 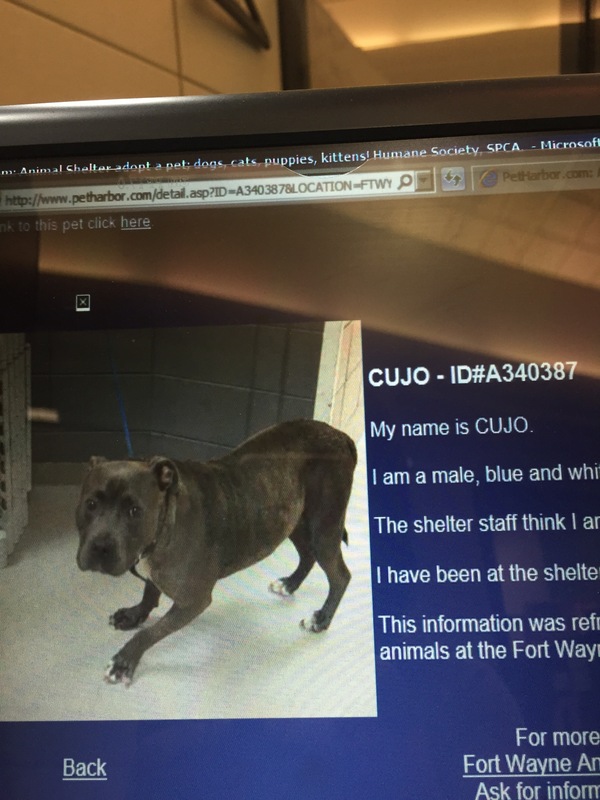 Nearly exactly 30 days later, my heart sank to see Cujo’s picture on the stray site at Animal Care and Control. Come back as we explore the journey of these two blue dogs.